New Delhi : With the announcement of dates of Lok Sabha Polls 2019 approaching, the Pyramid Party of India on March 6 announced its plans for the upcoming General Elections and Assembly Elections. The party, which has been fielding candidates in South India, wishes to make its presence felt in the Hindi heartlands this time around and even propagate its ideologies. The founder of the Pyramid Party of India, Brahmarshi Pitamaha Patriji, while addressing the media persons during a press conference in New Delhi, announced that his party will contest on all Lok Sabha seats in the states of Andhra Pradesh, Telangana, Uttarakhand, Uttar Pradesh, and Haryana. The party will also field candidates on all assembly seats in Andhra Pradesh assembly polls. At the press conference, the party also released its manifesto for the Lok Sabha and Assembly polls in Andhra. 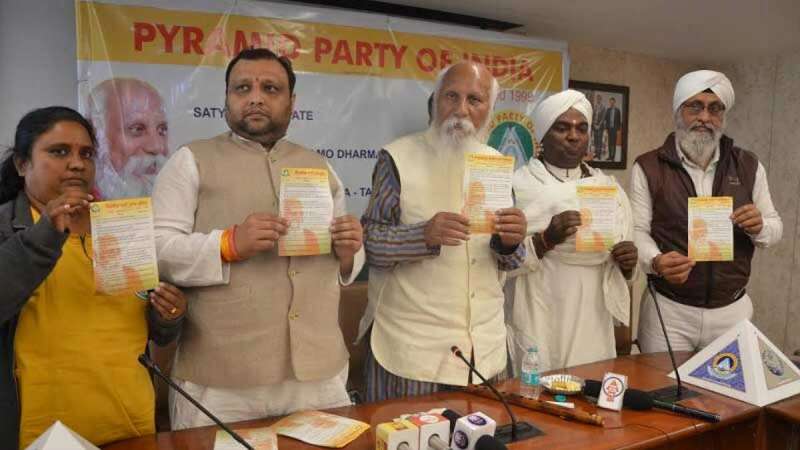 While interacting with the media and unveiling party's manifesto Brahmarshi Patriji said, "Pyramid Party of India will contest on all Lok Sabha seats in the states of Andhra Pradesh, Uttarakhand, Uttar Pradesh, Haryana and Telangana. We are aiming to make our presence felt in north India as well, this time. In the Andhra Assembly elections, we will field candidates on every assembly seat and we are confident about doing well in the elections. All are welcome to be a part of his Spiritual Movement which will lead to Enlightenment of the Nation. " Brahmarshi Patriji added further, "Pyramid Party of India is formed to transform all the People of India into meditators, enlightened persons, vegetarians and peace-loving people during our current lifetime itself through the methodology of the Electoral Process. Only Enlightened are the Right People for Good Governance. Let us choose and elect only the Enlightened Masters. His party stands with poorest of poor and that is why the primary membership fees of teh party is only Rs. 10." While highlighting some of the poll manifestoes, the party's president Saurabh Bansal said, "Our party aims at providing Free Health Care facilities to every citizen. Essential commodities shall be made available uninterruptedly through a revamped Public Supply System. Equal rights and opportunities to women on par with men in all walks of life. Education will be made compulsory and totally free up to Graduation. Individual merit shall be the preferred criteria for opportunities in any field of human activity." "From 1999 to 2018 we are contesting in Telangana, Andhra Pradesh, Karntaka, Tamil Nadu and Pondichery. Now we are interested in fielding candidates in Andhra, Telangana, Tamil Nadu, Karnataka, Pondichery, UP, Uttarakhand, Delhi, Chandigarh, Haryana, Himachal Pradesh and a half of Madhya Pradesh and Maharashtra," added Bansal. The party's founder and president exuded confidence about a good show in the forthcoming elections. The Pyramid Party of India was formed in the year 1999 and founded on the philosophy of the ancient Greek philosopher, Socrates, who firmly believed that the best form of government was one ruled by an individual possessing the greatest ability, knowledge, and virtue. And, the highest knowledge is possessed by that individual who truly knows himself. This knowledge constitutes the ultimate wisdom. It enables man to act in a virtuous manner at all times because he knows what will bring him true happiness. And the highest good for any human being is happiness. This essential Socratic Teaching is the funding theme for the “Pyramid Party of India”. It was conceptualized for the first time in the year 1998 by Brahmarshi Patriji and actualized in the year 1999 by the PSSM. It participated in the 1999 General Elections for the first time in Andhra Pradesh in more than 50 constituencies and polled several hundreds of votes per constituency. The party contested in the 2004 General Elections in a nearly 100 constituencies with an aim to spread the twin concepts of vegetarianism and meditation. Thousands of votes were polled for the Pyramid Party per constituency. Slowly yet steadily, the party has gained popularity over the years in the region and it now aims at reaching out to a larger number of voters.